Ian was nominated by Billboard Magazine to be among the top songwriters in 2004 and 2005 for his work with AÃ±aVaÃ±A. Stick a fork in it, it's finally done! Ian C. Bouras has earned great reviews, and with "Two Sides to Every Sunset" continues to show they are well deserved. "an impressive artist...peer into the creative soul of a quintessential artist." - Skope Magazine "no doubt a musical mastermind behind the glass" - Drew Blackwell, Rock and Roll View "his playing style and guitar ambience is to die for." - Cyrus Rhodes, Indie Music Digest Check it out at: http://www.cdbaby.com/cd/iancbouras Thanks for your support. Happy Holidays! "The Certaintity of Being Found" Reviewed by RadioIndy.com! 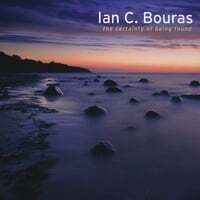 The smooth sounds on Ian C. Bouras' album, "The Certaintity of Being Found," are a fantastical trip of unique musical talent. This album almost surprises the listener with the range of genres that are under the artist's label of "ambient." From Reggae to flamenco guitar to a little dub step, this album packs a punch...in the most melodious way possible. "Thoughts On Angles and Sarcasm (Interlude)" is a track that breathes. That is to say, it has a slight pause every couple of seconds after each of which a fuller tone of the song comes out. Utilizing an acoustic guitar that is confident and solid, this track really speaks to the talent of the artist. "The Bounce," as its name may suggest, is a groovy, danceable tune, and has slow moving tempo interludes; adding to the easy listening vibe that comes with each of these tracks. All around, "The Certaintity of Being Found" is great for fans that enjoy fresh and original ambient Reggae music. RadioIndy is pleased to announced that we have published our CD Review of Ian C. Bouras music to CD Baby. FANS - Please checkout Ian C. Bouras online! FANS - Please checkout Ian C. Bouras page and sample / purchase some great new music! FANS - Please checkout Ian C. Bouras iTunes page play / purchase some great new music! Radioindy has published Ian C. Bouras CD Review to lala Music Online. FANS - Please checkout Ian C. Bouras la la and play / purchase some great new music! RadioIndy is pleased to announced that we have published our CD Review of Ian C. Bouras music to Facebook.